Accepting the Crate: The first step in the process is getting your puppy to accept his new dog crate. This is achieved by making it as comfortable as possible and building a positive association to the crate. So first, find a place in your home, away from drafts, to set up your Schnauzer's dog crate. Place some thick towels, a blanket or fleece doggy liner (crate pad) and a small pillow inside the crate for your puppy to snuggle up into. Remember, your puppy just left his litter mates where they would snuggle up together to fall asleep. It's also a good idea place an article of your clothing inside the crate, as well (like an old t-shirts or pair of socks). Anything that has your scent on it and definitely something you don’t mind getting soiled. puppy crate training tip: If after a few attempts your puppy still will not go inside the crate, you will need to place him in there... but do not close the crate door. It is important for your puppy to learn that crate is his own safe haven and not a prison or confinement. So do not close the crate door during the first several entries as your puppy could develop a fear or anxiety toward his crate, viewing it as a bad thing or punishment. After your puppy enters and exits the crate several times oh his own, it will be time to teach him to accept the crate with the door closed. Once you close the crate door, your puppy will undoubtedly cry. Although the video does not address this, it probably will happen. If it does, just ignore your puppy completely. Say nothing at all. Just sit nearby and watch. When your puppy quits crying, open the crate and praise him. 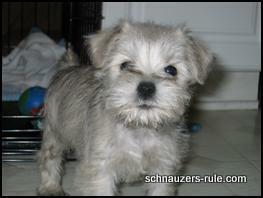 Then spend the next 15 to 20 minutes playing with your new Miniature Schnauzer puppy. Take a Potty Break: Now before we try to get our puppy back in the crate, it's time for a potty break. Puppies need to urinate quite frequently as their bladders are not fully developed. So, take your puppy to his assigned potty area (outside is best or put him on his pee pads). Use the command you have chosen for the task (hurry-up; go pee-pee; go potty) and when he relieves himself, praise him. Continue Training: Now it's time to repeat the process. Spend the next 15 minutes, again with the dog crate door open and try to get your Miniature Schnauzer to enter his new crate on his own. If he still will not go in on his own, place him back in the crate for another 10 minutes or until your puppy quits whining. Throughout the days ahead, try dropping little pieces of kibble or treats inside the puppy crate to further encourage your Schnauzer to enter his crate on his own. The treats will reinforce positive associations with the crate. In the beginning, it is best to stay in the room with your puppy while he is being crated. ie. don't crate your Schnauzer and leave home or the room right away. Otherwise, your Schnauzer may associate being crated with you leaving. For example, have your puppy go inside his crate while you wash the dishes or work on bills. Your puppy will begin feeling safe and comfortable in his own little environment. Slowly add leaving the room for about 20 seconds at a time and when you walk back inside, just ignore your puppy. Introduce your puppy to the dog crate. Encourage puppy to enter crate. Let puppy investigate and enter in and out of the dog crate freely several times before latching shut. Have puppy enter crate and shut door. Wait until puppy quits crying. Open door, release puppy and praise him. Take puppy to assigned potty area. Praise puppy after he relieves himself. Play with puppy for 15 minutes. Repeat the entire crate training process. 3) and a Sense of humor! 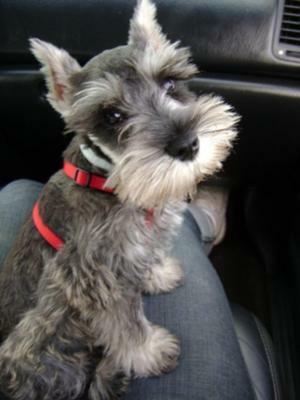 Yes, it takes time to train your puppy, but you will find that your Miniature Schnauzer wants nothing more than to please you. Your puppy will learn fairly quickly, that if he does not whine... he gets to play and if he relieves himself outside... he gets praises, and praise and play are exactly what he wants! Crate Training: The Dreaded First Few Nights! The very last thing you should always do before placing your puppy in his kennel for the evening is take him outside to relieve himself. 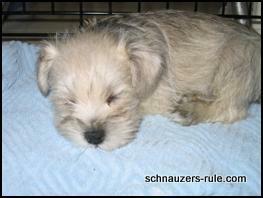 The first few nights, your new Miniature Schnauzer puppy IS going to cry and whine well into the night. The best thing you can do is just ignore it. If you give-in you will be rewarding the whining behavior and you don’t want to do that! Don’t worry. Your puppy will tire and settle down eventually. And once your Miniature Schnauzer does begin to sleep during the night, when he whines, it will be because he needs to go potty and doesn’t want to mess in his dog crate or bed. Your adorable new Miniature Schnauzer puppy sleeps through the night and finally you get a much needed good night sleep, too! (note: In the beginning, expect to take your puppy outside to relieve himself every 3 hours). Since your puppy will not want to soil the area he sleeps, he will learn to potty outside of his crate. Crate training therefore will assist you in housebreaking your puppy, as well. Remember, puppies have small bladders and will need to eliminate often. Place the dog crate in a quiet cozy spot of your home. It is important not to ever use the puppy crate for punishment or leave your dog crated for long periods of time. Be sure to remove your puppy's collar before confining him. Collars have been known to get stuck on parts of a kennel causing a dog to panic and injury or even worse... strangulation. About the crying: Your puppy has not slept alone before. He is crying because he misses his mother and litter mates that kept him safe and warm through the night. To help your puppy (and yourself) to a good night's sleep, play with your puppy just before bedtime to tire him out; be sure to let him go potty one last time; and if necessary place the crate in your bedroom so he is not totally alone. Further Reading: How a dog exercise pen can provide your new puppy with a safe enclosure to romp around and help with house training too. "Knowledge Share"... If you found this page on Crate Training a Puppy helpful and informative, please share it with your dog-loving friends by clicking on one of the share links (like facebook, twitter, and google +1) located at the top right or bottom of this page. Announce the arrival of your new Mini Schnauzer Puppy by sending family & friends this FREE ecard!